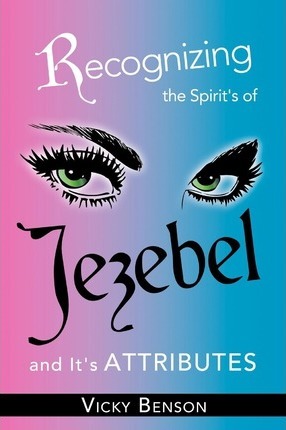 JEZEBEL SPIRIT Recognizing the Spirit of Jezebel And It’s Attributes describes in vivid detail how the spirit of Jezebel, one of the most insidious evil spirits in the Church today, can rest on a person without their knowledge, using them to split churches, divide marriages, and kill relationships of families. But God has given His children all power and authority through His son Jesus Christ, to overcome this controlling spirit and set the captives free. In this book you will learn various attributes of the Jezebel spirit and most importantly, how to minister deliverance to those caught in its grip. Every Church Pastor and Church Administrator should read this very important book that brings inspirational knowledge of the Spirit of Jezebel. This reading could very well be the book that delivers the knowledge to the Church that continues to divide and separate. ….in „Recognizing the spirit of Jezebel and It’s Attributes..“. Author Vicky Benson draws from the „Holy Spirit“ and the „Holy Scriptures,“ bring out biblical insights coupled with personal examples, to give readers the wisdom and clarity on Demonic Spirits linked to that of Jezebel. The Spirit of the Lord called Vicky Benson into ministry in the year 1979, one in spirit with her husband, Apostle and Prophet Roger E. Benson. Their ministry, „The Last Days Ministries International“ is based on Luke 4:18-19. Over the five-year period of time, much warfare and many spiritual battles raged in their lives. It was the 28 years of experience that enabled Vicky Benson, in the Lord, to write this book, teaching on the attributes of Jezebel. She gives God all the Honor and Glory for this book and gives God all the Praise for it being published.